I live in Nashville, TN, and there is this fab-u-lous book store called Parnassus Books. They have an amazing amount of authors who come in to do book signings, I think because the owner is a published author herself, Ann Patchett, and co-owner publishing veteran Karen Hayes. The book signing often includes a brief speech, or in this case interview with the authors. 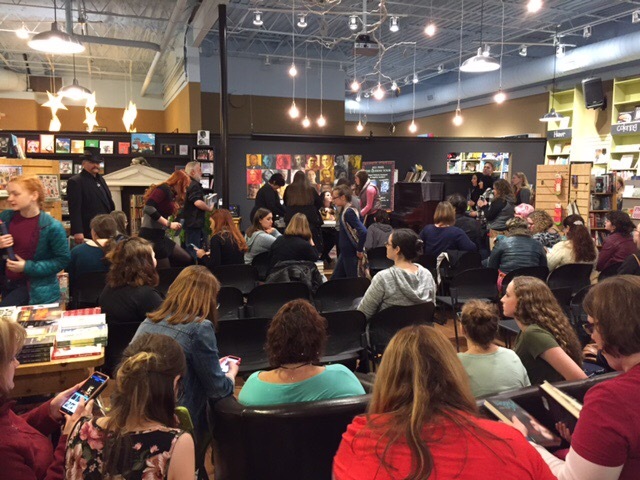 Last Wednesday I went with my mom and sister to Parnassus to see Victoria Aveyard and Sophie Jordan’s book signing. Victoria Aveyard has a very successful series called the Red Queen and she was signing the third book, which was just released, called Kings Cage. She is touring with Sophie Jordan who is releasing the second book, Rise of Fire, in her series Reign of Fire. Both of these books are young adult fantasy novels, a genre which I love and I thought it interesting that the audience was not just filled with teenage fans. I am not young myself, and my mother has read both series and she’s in her mid seventies. The event started roughly around 6:30p and was standing room only. See picture above, it was packed! My sister and I agreed that next time we would arrive early, but we borrowed a seat from the staff so my mother didn’t have to stand for the next hour and a half and settled in, not really knowing what to expect. As the clock hit 6:30p there was a tense anticipation. When the authors were introduced, we found out that Victoria Schwab would be asking them both several questions before opening up questions to the audience, and everyone sat forward eagerly. Now, I am going to admit up front that I haven’t read either of these series. Oh no! I actually even own them, but haven’t gotten around to them yet. Too many books and not enough hours in the day to read! Damn job gets in the way! I was pleased to discover that there were several non plot related questions, and really both authors weren’t going to give anything away during this convo. I’ll share a couple of interesting tidbits, but pls know that I am paraphrasing their answers. What was the seed or origin behind the plot for your series? SJ: I love survivalist shows on TV. Love Riddick and had thoughts of a planet of death and darkness. Then I thought about what a world would be like without light? So I crafted a world that was shrouded in darkness and had only one hour of light a day. In that one hour of light things would come out and feed on everyone. What do you look forward to writing the most? SJ: I also write romance novels, so it’s not too surprising that I like the romance. I also like the big reveal. When a deed is said or done that rips the characters intentions wide open. How much does the message of a book fight against the story of the book? She did say that the story has to happen organically and not be a commentary. SJ agreed that the story comes first, but did comment about agreeing that history is cyclical. There is a rumor that both of you may have tv or movie deals? VA: nothing concrete yet, but Red Queen may be made into a movie and Elizabeth Banks has signed on to produce. Are there any books that you are looking forward to reading? VA: The Hate You Give by Angie Thomas, it’s supposed to be great! After that they signed books. I know it’s the norm for people to being in a book of their own for the author to sign, but seriously, people had stacks! And it was taking forever. Since we got there late, not knowing how this worked, we were just going to leave our books with the store to have them signed and pick them up later, but once I mentioned my mom was 75, and that she couldn’t stand for that long, they very kindly let us cut to the front. I took a cute picture of my mom with the authors (below). That’s Sophie on the left, Victoria on the right and my mom standing behind them. (Cute, right?) It was a fun couple of hours with a couple more books added to my TBR pile. Look for reviews from these series soon! 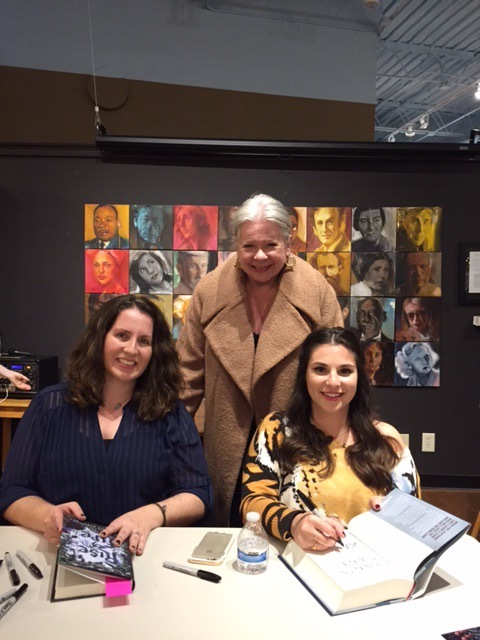 Sophie Jordan, my mom, and Victoria Aveyard! What part of Nashville is this in? I will have to look it up. I’m 2 hours from Nashville. Parnassus books is in Green Hills. This week they are having a signing with CJ Redwine. They have authors from all different genres. You should check out their website! I absolutely LOVED the Red Queen Series, I am just about finishing the last one that got released last week and I can’t get enough!! I can’t wait to start them! Especially after hearing a few details at the book signing!